The Parador of Argomaniz occupies a splendid Renaissance palace, overlooking the beautiful plains of Alava and the Gorbea mountain range. The small local hamlet of Argomaniz is a pleasant village for an evening walk and the Ullibarri Gamboa reservoir is not far away. 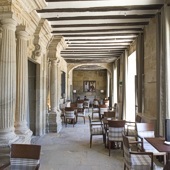 Napoleon rested in the Palace before attacking the town of Vitoria/Gasteiz during the Peninsular wars. The coat of arms of the Larrea family who owned the palace at that time is one facade of the building. The interior has remarkable noble rooms with much wood evident in the floorings and ceilings, wooden furniture and chests. This Parador has a total of fifty three twin bedded rooms and two easy access bedrooms all having satellite television, telephone, mini bar and safe. 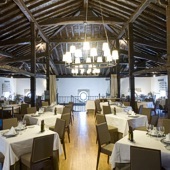 The Parador has air conditioning, central heating, lift, parking facilities (without security and limited places), restaurant, bar for residents, satellite television, currency exchange, garden with a children's park, gift shop, free wireless internet and facilities for the disabled. The Argomaniz Parador is able to have business conferences for up to 270 persons. Sponge cake with cream and caramel; In addition the Alava region is noted for its fresh vegetables. The city of Vitoria/Gasteiz is eight kilometres from the Parador and the places to visit are the Santa Maria Cathedral, the Escoriaza-Esquibel Palace and the Villa Suso Palace, and the old neighbourhood of the city. Also in the city there are museums of Arms, Fine Arts, Natural History, and Playing Cards. It is the area of fine wines with Rioja Alavesa being the centre of the Rioja wine producing area. August is the month for the festivals in the area. August 4 is the date on which is celebrated the Feast of the Virgin Blanca of Vitoria/Gasteiz. After the religious celebrations the partying continues long into the night. It is the turn of San Sebastian on the 8th, when the "Semana Grande" (great week) is celebrated. On the 15th the the fun moves to Bilbao who have their own "Semana Grande". The reception of the Parador can arrange various outdoor activities with a few days notice. These are usually based on the reservoirs of Gorbea, the Natural Park of Garayo or the Valderejo Natural Park which is a nature reserve. The Parador Argomaniz is approximately 76 kms from Bilbao and the famous Guggenheim museum, designed by the American architect Frank O. Gehry. Distance from the nearest airport is approximately 60 kms, train station is 12 kms away and the nearest port is 90 kms away. My wife and I spent 5 wonderful nites at Argomaniz last Oct. The archetecture, the furneshings,the setting, the entire staff, and above all the supurb cuisine were all outstanding. And we would say the same for the other 3 Paradores we stayed in during our splendid month in Euskadi and Northern Spain. My wife and I have stayed at Argomaniz a couple of times , the rooms have been very pleasant and comfortable, reception staff very helpful as all the staff , pleasant and comfortable bar . The restaurant is amazing and the food very good and reasonably priced. Always stay in Paradors when in Spain and would highly recommend them. Look forward to our next visit . Nous avons été accueillis de façon excellente et avons profité d'une chambre très spacieuse avec une vue magnifique. Le repas du soir ainsi que le petit déjeuner étaient parfaits et d'un prix tout à fait abordable. Le personnel s'est montré très aimable et très efficace. Le Parador d'Argomaniz est idéalement situé pour découvrir l'Avala. Séjour parfait. We thoroughly enjoyed our brief stay at Argomaniz. Everything was excellent except the weather - it was the first snow of the year. The restaurant was especially good, service and food. We will probably stay there again, thank you. 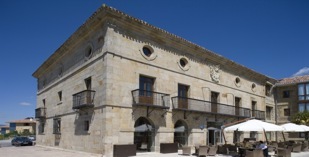 Napoleon's headquarters in the Peninsular war, the Parador of Argomaniz is now a luxury hotel.